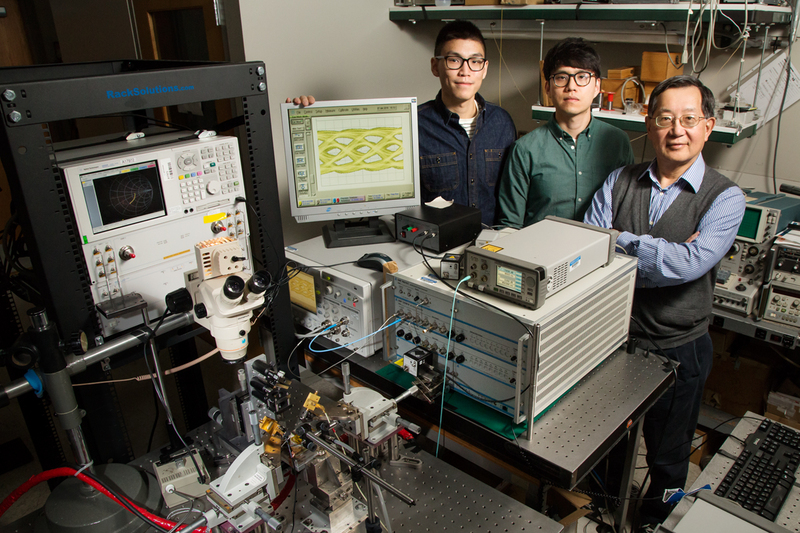 University of Illinois engineers developed fiber-optic technology that can transmit data at a blazing-fast 57 gigabits per second, without errors. Pictured are, from left, graduate students Curtis Wang and Michael Liu with professor Milton Feng. CHAMPAIGN, Ill. — With record-breaking speeds for fiber-optic data transmission, University of Illinois engineers have paved a fast lane on the information superhighway – creating on-ramps for big data in the process. Graduate researcher Michael Liu will present the research team’s developments in oxide-VCSEL technology, which underpins fiber-optic communications systems, at the Optical Fiber Communication Conference and Exposition today in Anaheim, California. The research team was led by electrical and computer engineering professor Milton Feng – who will be in attendance at the conference – and also included professor emeritus Nick Holonyak Jr. and graduate researcher Curtis Wang. Feng’s group has been pushing VCSEL technology to higher speeds in recent years, and in 2014 was the first group in the U.S. to achieve error-free data transmission at 40 gigabits per second (denoted as Gbps). Now, in a series of conference papers, they report 57 Gbps error-free data transmission at room temperature, as well as 50 Gbps speeds at higher temperatures up to 85 degrees Celsius (185 degrees Fahrenheit). Editor’s notes: To reach Milton Feng, call 217-333-8080; email mfeng@illinois.edu. The paper “50 Gb/s Error-Free Data Transmission of 850 nm Oxide-Confined VCSELs” is available online as part of the OFC Proceedings.